Developing a keen appreciation of Scotch is as much a part of becoming a man as developing a keen lack-of-appreciation for musical theater. To become intimately acquainted with this timeless elixir, click here to RSVP for the House of Walker Experience. The House of Walker Experience is a blessedly private event where distinguished guests will sample select Johnnie Walker whiskies. The affair is led by a Master of Whisky, though this evening you could also call him Master of The House. Or maybe stick with Master of Whisky. 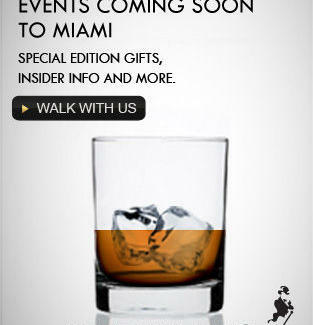 Just such a tasting is coming to Miami 9/15-9/18, and as you might have guessed, you're invited. Sign up at johnniewalker.com, and let the keen appreciation begin.